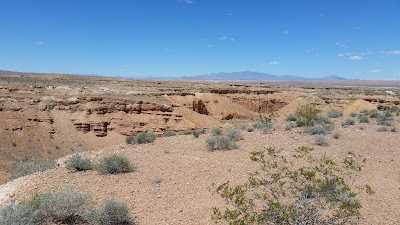 Temperatures in Arizona continued to rise so I headed northwest up into Nevada's Moapa Valley to BLM land along Sand Mine Road seeking cooler climate. 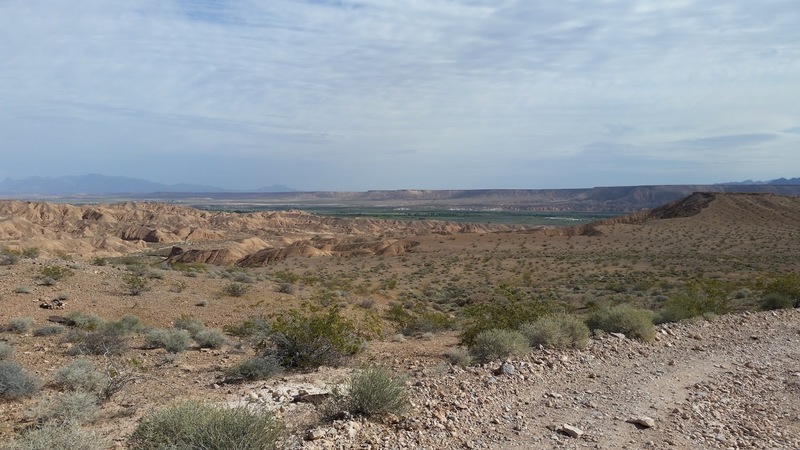 Moapa Valley runs northwest to southeast and is situated in Clark County about 30 miles northeast of Las Vegas. The valley was originally settled by the Anasazi people around 350 BC. 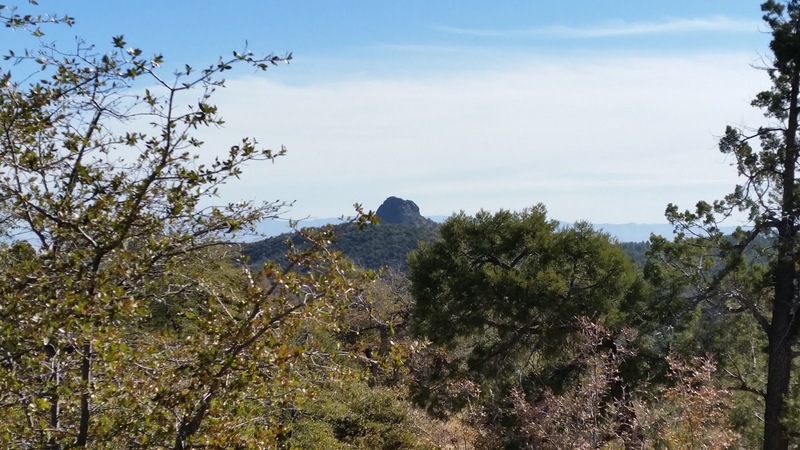 In the late-1860's the first white people, Mormon pioneers, immigrated into the valley. You don't need 4 wheel drive if you stay close to the road. 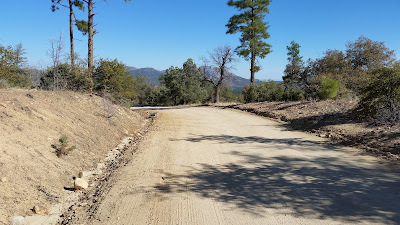 I did my now practiced routine of finding the first place along the road, parking the rig there and then proceeding on foot to find the best available site in the area. I found a pretty good one about a half mile further along Sand Mine Road. 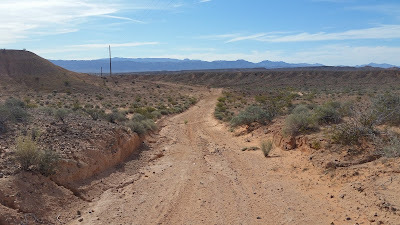 The Mini's desert site about 50 yards off Sand Mine Road. Initially, temperatures during the cloudless days were in the low to mid-80's and nights were in the mid-50's, pretty ideal! 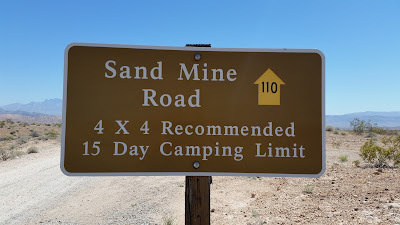 I did my daily walking along Sand Mine Road which is mostly hard packed dirt and gravel. My site was pretty secluded even though it was out in the open desert, my nearest neighbor was a half mile away, then he left two days in and my next nearest was about a mile away. This canyon separated my camp area from another further north. 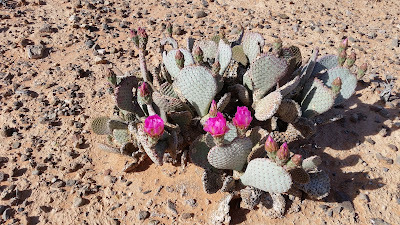 Some of the cacti in the area were flowering. 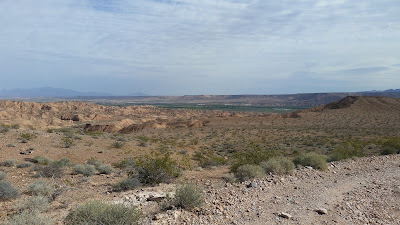 One of the things I really appreciate about desert camping is the virtual absence of flying insects of any kind. Often while camping in forests you have to hurry in and out of the trailer to avoid flys, or worse, mosquitoes flying in the open door, not so in the desert! 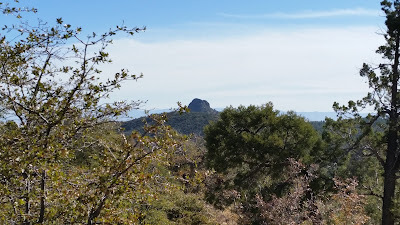 I called this area along my walk "The Badlands". I got to Sand Mine Road around the middle of April and as I mentioned for the first week the weather was just ideal with the bonus of cloud-free days providing great sun for the Mini's solar setup. 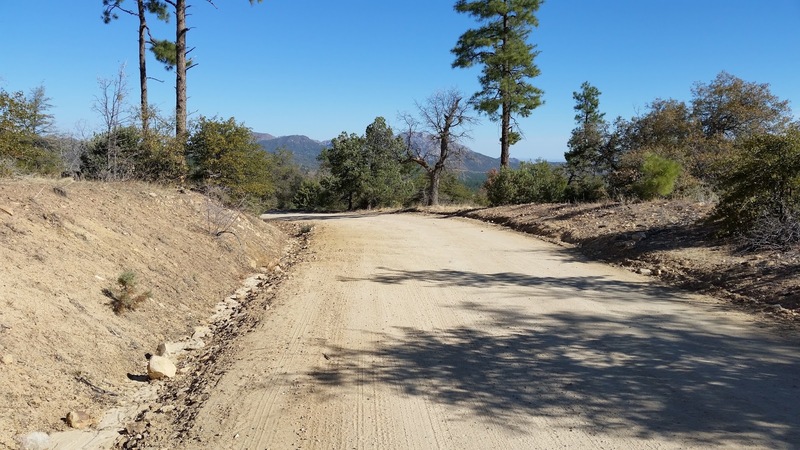 I intended to stay the whole 15 day limit but unfortunately the second week the temperatures spiked into the mid to high 90's after extremely high winds blew in a warm front. 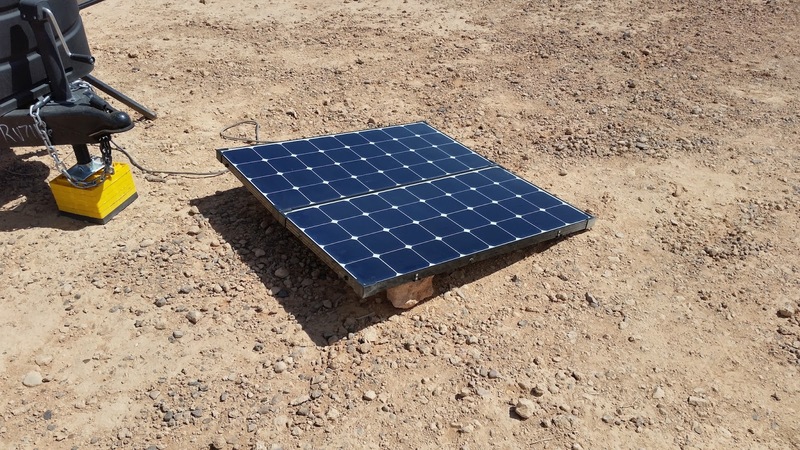 High winds blew over the solar suitcase so I had to lay it almost flat. 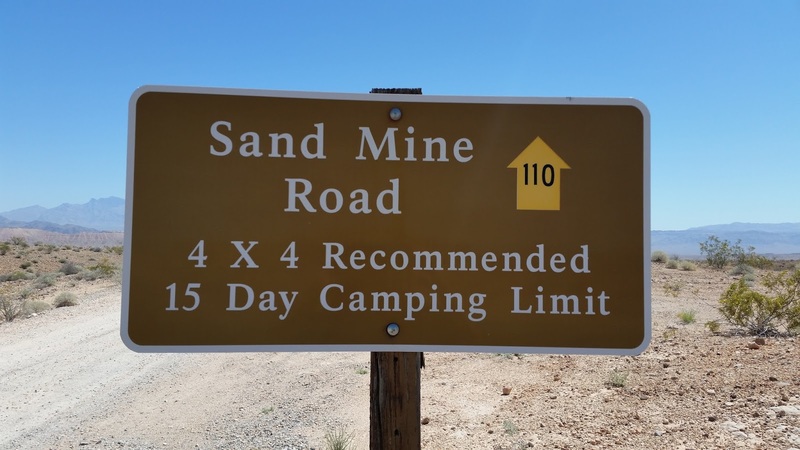 With Lin's Grocery, a full service grocery store, only seven miles away in Overton, NV it's very possible to complete the whole 15 day stay along Sand Mine Road without running out of supplies. 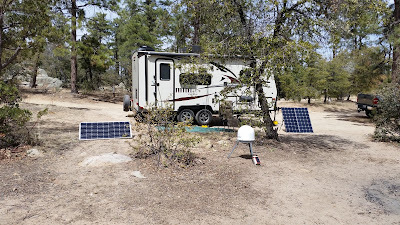 Next year I might come a couple weeks earlier in the season and avoid the heat and make the full 15 days, the peaceful uncrowded nature of the campsites coupled with the excellent cellular coverage make it worth it! 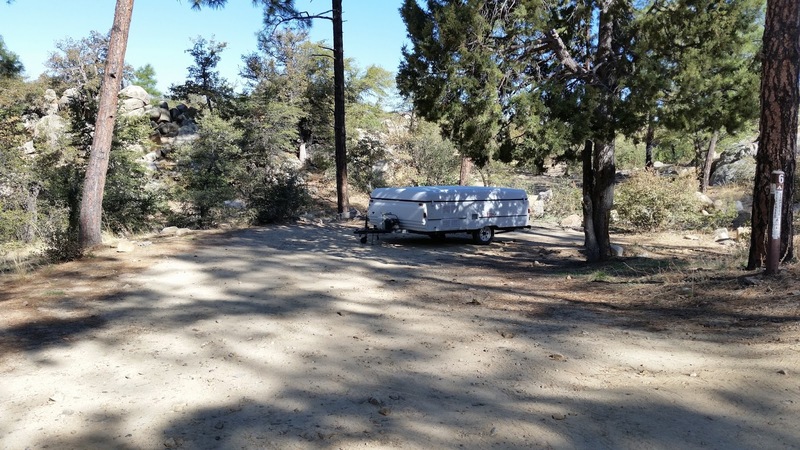 Readers of this blog know that I try to avoid staying in "pay-for" campgrounds like KOA etc. and instead try to stay on free camping land. 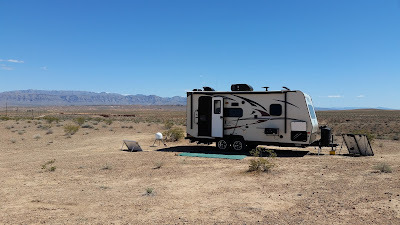 As I meander around the country free camping isn't always available sometimes due to the route I'm traveling or because I'm in a state that doesn't offer very much free camping (looking at you Minnesota!). It seems at least once a month I'll bite the bullet and fork over the full cost of a one or two night stay at a commercial RV park....begrudgingly. All those times I've paid full price (sometimes as much as $45/night) I could have paid half price instead! How is that possible and why the heck wouldn't I take the half price instead? 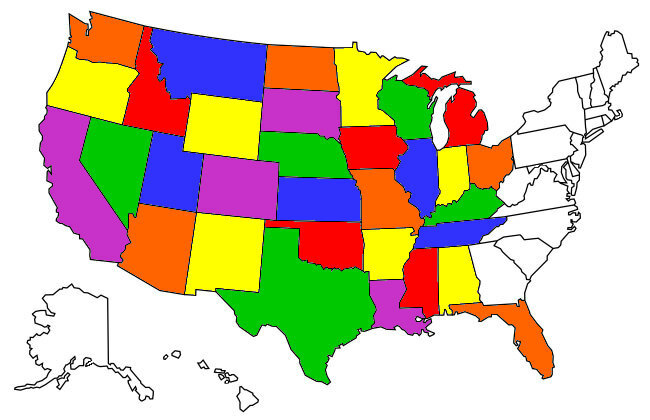 The first answer is that there is a RV discount card you can use that gives 50% discounts at thousands of RV parks nation wide. The second answer is ..... I dunno. Passport America is the discount card I'm referencing and I'm embarrassed that I've been full-timing for almost five years and I just got mine last month. Since early March I've used the card three times and have already saved MORE than the $44/year the card costs! I'm kicking myself for not having gotten the card the day I set out to full-time in the Tank, I would have saved hundreds of dollars by now. 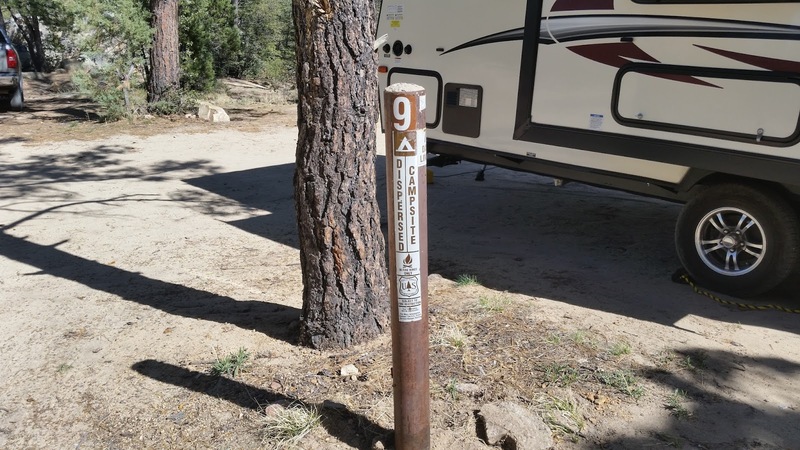 A couple of caveats: not every RV park accepts the discount card (go to their website: Passport America Park Map ) The second is that many member parks put rules up on the usage, like limiting the number of discount nights you can get or the season you can use it in, like not during the busy season in Arizona from December to March. 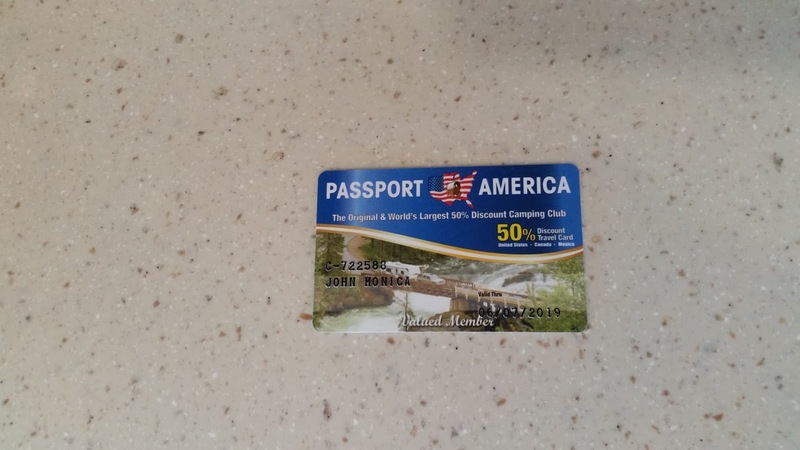 Because I'm a member of the Escapees RV club Passport America adds an extra three months onto the subscription for a total of 15 months for $44 so if you get one check to see if any groups you belong too are eligible too. The cool thing is the flexibility the card gives you on your travels -- instead of shying away from a $35/night park now you have the option of paying $17.50 for at least the first couple days. I made a mistake as a newbie full-timer in not having this card with me the day I headed out and it cost me hundreds of dollars in full-priced stays, now you'll be able to avoid that mistake. When you boondock for an extended period of time your RV, being stationary for a long period, can become the target of small gray furred hitchhikers. Back when I was still in the Tank a field mouse had invaded it's interior spaces and it took me 4 days to trap it. So, after I moved north from the BLM land I had been on for 14 days to the Prescott National Forest outside of Prescott, AZ (review coming) you can imagine my dismay when the first night camping I heard the pitter patter of little feet inside the Mini's lower cabinets. I've unfortunately become adept at identifying the sound of a field mouse within an RV so I knew I had to get to Walmart and buy a mouse trap -- by now you'd think I'd be carrying a supply! Mouse traps have changed in design since back in my day. 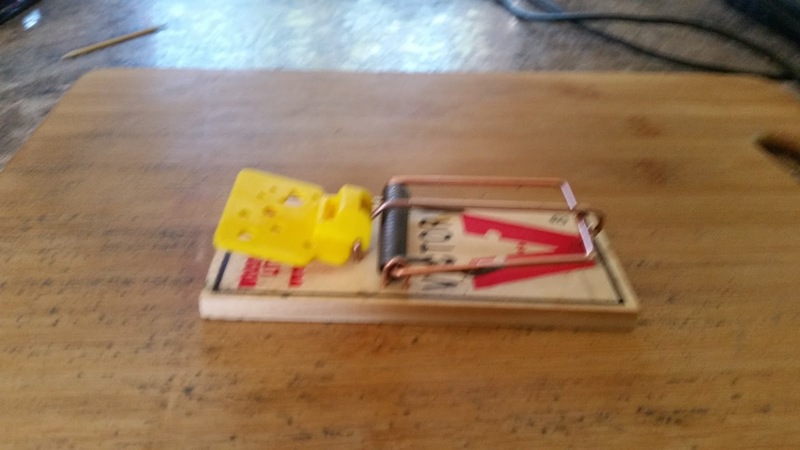 (Build a better mouse trap?) The ones I got from Walmart looked roughly the same as the old days but had the addition of a yellow plastic pressure plate that, when depressed by the animal going for the bait, releases the spring loaded bar that zaps the mouse. Put the bait on the back of the pressure plate, mouse steps on it, blamo! I was successful using crunchy peanut butter as bait against the Tank's mouse so I went that route again and upped my game by pushing a half a walnut into the peanut butter to make it more irresistible. 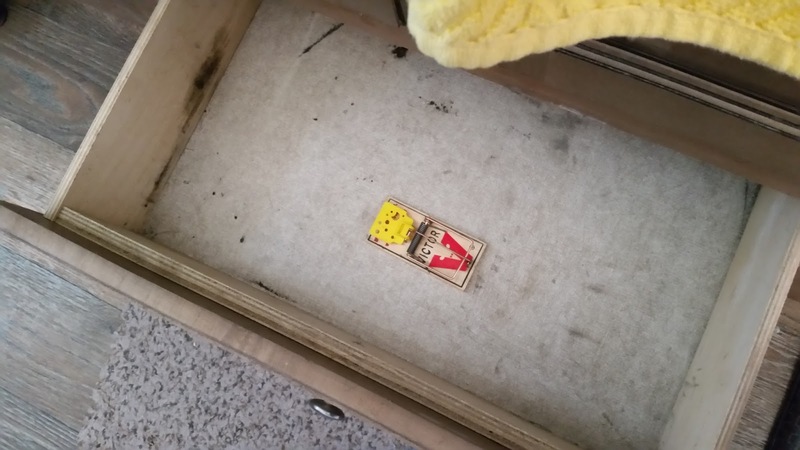 Since I heard the mouse scampering all over in the Mini's lower cabinets I placed the baited trap into a bottom drawer and waited in anticipation to hear the tell tale snap that would announce my hitchhiker was no longer of this world. I finally got tired and went to bed having not heard anything from the trap drawer however once in bed I heard the mouse running around for most of the night. the trap was completely clean of bait, including walnut, and was still set! Round one to Mickey! Having almost taken my finger off several times due to the hair trigger nature of the pressure plate the only thing I could theorize was that the mouse had approached from the side of the trap, completely missing the pressure plate and enjoying his free meal at my expense -- it didn't even leave a tip! I re-baited the trap and put it back in the drawer thinking how lucky the mouse had been to unwittingly approach the trap from the side and assuring myself it couldn't do that twice. About 3 am that morning I was awoken by the trap going off and thought my problem was taken care of. I was too lazy to get up and check the trap figuring it'd wait until the morning but instead experiencing silence a bunch of thumping started coming from the trap drawer. The mouse was still very much alive and seemingly dragging the trap around the drawer bumping into barbecue utensils I had stored in it. I reluctantly got up, turned on the interior lights, armed myself with a steak knife and opened the drawer. Instead of finding a partially trapped mouse it's fur was stuck in the trap and, upon seeing me it clanged the trap against a barbecue spatula got free and turned into a gray blur jumping out of the drawer into the back of the cabinets. This guy was good! Mickey takes round 2! The next morning I re-baited the trap for the third time ( running low on walnuts) and, to speed up this story, Mickey's luck ran out. This time he must have stepped squarely on the pressure plate and it looked like a very clean kill, ending things without too much suffering. I have a picture of his demise but as this is a family blog I'll refrain from including it in this posting. 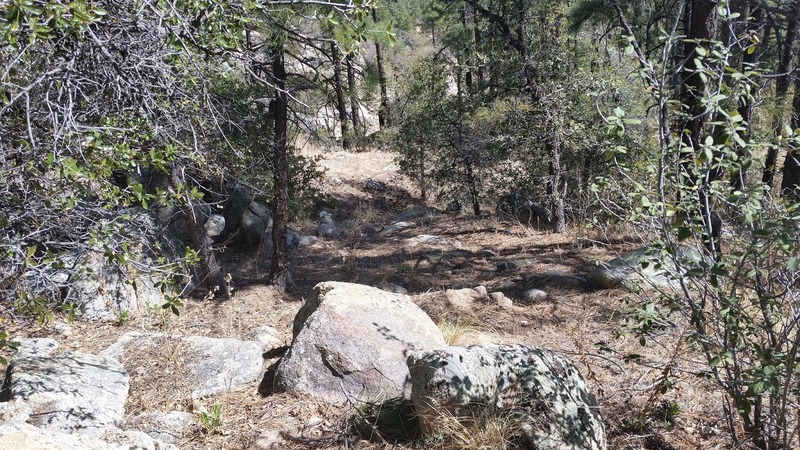 Thus the three day Battle of Thumb Butte (where the battle took place) came to a conclusion. I'm now carrying a trap as part of the Mini's standard load out although I know I'll never be able to keep walnuts in stock because I'll eat them myself.